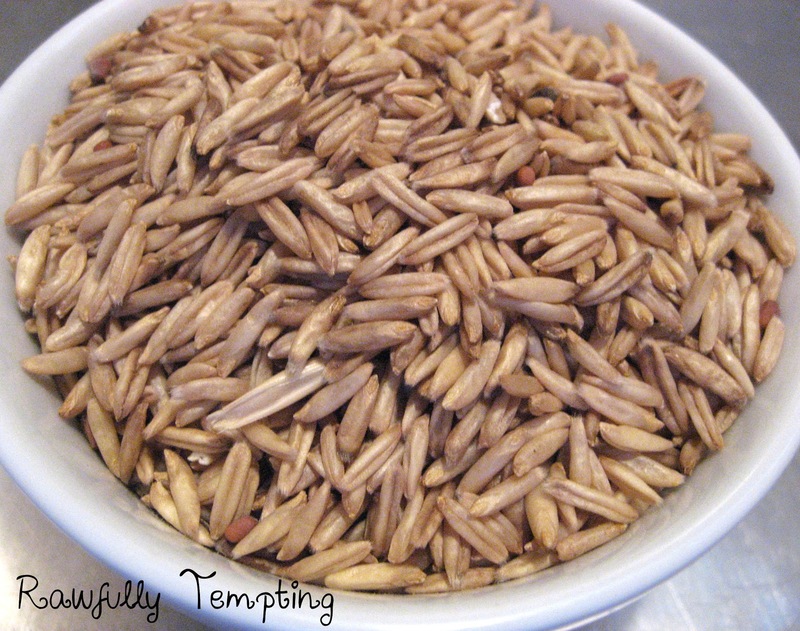 *Tip: After your oats are sprouted and dehydrated, store them in the freezer prior to grinding. I find this makes grinding them into flour much easier. It also keeps the grains cooler, so they don't heat as much during the grinding process. Sprouting Oats: I prefer hulless oats, or naked oats,(pictured above), which are naturally grown without hulls. There is no processing involved to remove any hard exterior, do these are really alive, and make great sprouters. Rinse well and soak in filtered water for 6-8 hours or overnight. Some say you only need to soak 2 hours prior to sprouting, but I find they don't get soft enough. (Don't ever use tap or chlorinated water for sprouting). 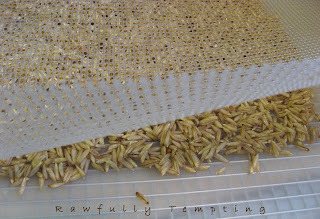 Rinse and drain the oats thoroughly. Place in a glass jar, covered with a sprouting lid or cheese cloth. Rinse at least once, making sure to drain well ever 6 to 8 hours or more. this keeps them from going rancid or getting moldy. (I turn my jar upside down at a 45 degree angle, over a bowl or towel). Ikea has a great dish rack that holds sprouting bottles very nicely. Let sprout until tails just begin to burst. (see photo). 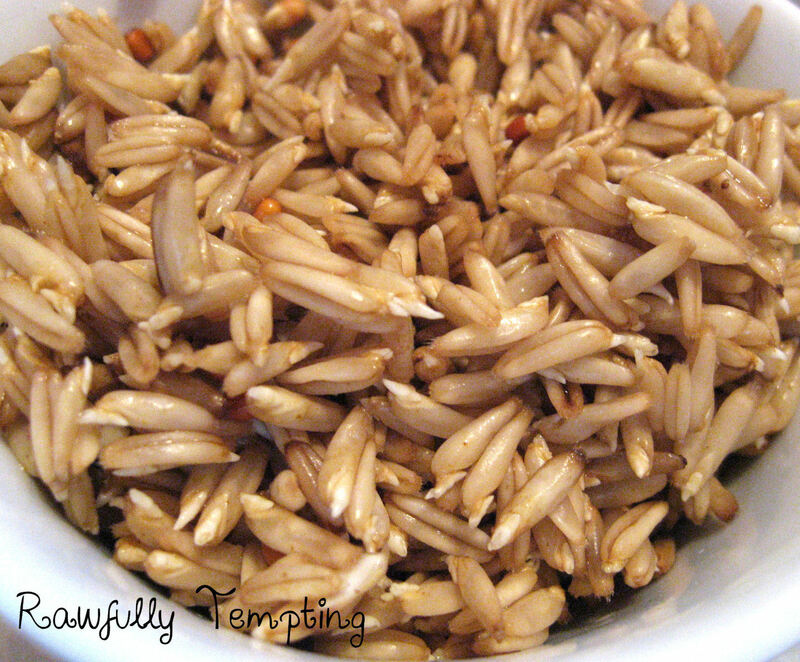 For raw oatmeal, soak overnight, and don't sprout, or sprout up to 1 day, rinsing every 6 to 8 hours. 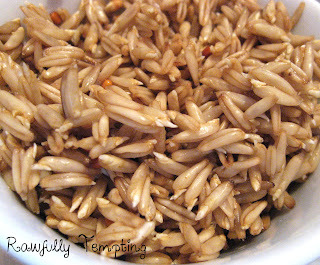 (Always taste and smell the grains after each rinse to make sure they are not sour). When tails form, the grain should be soft and chewy with a nutty flavor. Rinse, drain, and mix in a food processor. Add favorite toppings. If you want to make sprouted oat flour, place rinsed and drained sprouted oats on a non-stick dehydrator sheet, and dehydrate for several hours until completely dry. 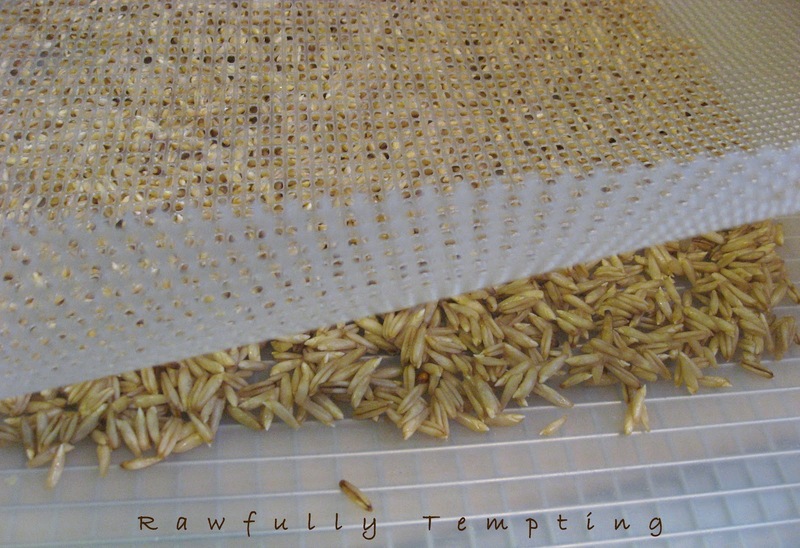 TIP: Place a mesh dehydrator screen on top of oats to stop from blowing off tray in dehydrator. They are now ready to grind into flour, however, place the oats in a glass jar, and freeze for a few hours, or store them there until you are ready to grind your flour. I use a nut and spice grinder by Cuisinart to grind my flour, but if you have a Vitamix dry blender, that would work great too. In the nut and spice grinder, use small amounts at a time (don't fill up the cup), stopping and starting the machine so you don't overheat it or the oats. 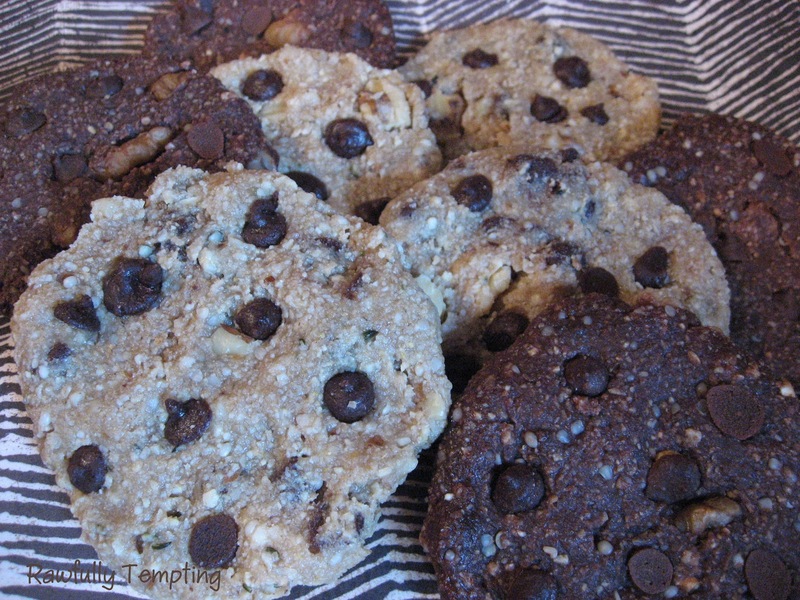 Store any leftover oat flour in a cool, dry place. I prefer the freezer. Remember, nuts, seeds and grains contain oil, once you release the oils, the product can get rancid rather quickly. If not using in a short period of time...FREEZE. 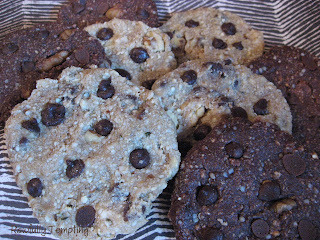 I made the cookies below using a combination of oat, cashew and almond flour. I love sprouted oat flour. *Please note: If you have Celiacs Disease, invest in gluten free oats, if you can find them sproutable. Oats, themselves, are pretty much gluten free, however, they often get cross contaminated in processing where they may be exposed to other gluten containing products. Some people cannot handle even that small amount of gluten that may be present. I am somewhat gluten sensitive, but I am able to eat sprouted oats and small amounts of sprouted Kamut with no problem. Those are some great tips: thanks for sharing. I should probably try gluten free oats at some point and see how I do: a bit scared even to try because of bad reactions to regular oats... But those grinding tips hold good for pretty much anything you'd want to grind, I guess. I'll have to check out your grinder: I just use the dry pitcher of the vitamix, or have even just used the cuisinart, although that doesn't do as good a job. Thanks Ela and yes,this tip is probably good for grinding other grains as well. The vitamix dry blender is fine. I don't have a VM yet...so I have to "rough it" with my little cuisinart....but it does the job just fine. I like that grinder because it's stainless steel and you can clean it out really well, not leaving any odor from spices or herbs. Let me know if you find the gluten free oats and if they are sproutable. I have to do a little more investigating in that arena, but the hulless oats don't seem to cause me any problems. When you sprout them and dehydrate them..they are even tasty as a little crunchy treat, nutty and sweet. Very good pointers!! Great post. Those raw cookies look so wonderful.